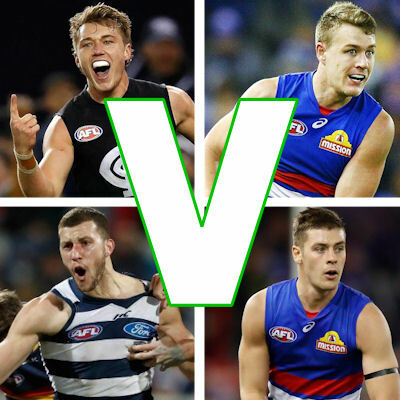 A couple of young MIDs and some borderline best six FWDs go head to head. Positives: Ceiling: No longer can we be found doubting Patty Cripps’ Fantasy ability. For a couple of years it seemed as if he would take the path of fellow tall-midfielder Marcus Bontempelli in being that 95 to 100 point player. However that is no longer a possibility, with Cripps enjoying a brilliant individual season, at-times being the lone bright spark in a Carlton season which had hardly yielded much excitement. He is currently averaging 108 points, and it’s his ceiling that really stands out when casting an eye over the season statistics. Cripps has tallied eight 110+ scores including efforts such as 130, 138, 140, 146 and, most recently, 162. Ceiling is a real drawcard with the on-baller. Form: After toning up just three times in the first eight weeks, Cripps has dropped below the triple-figure mark just three times since then. Cripps, who appears a certainty to become the future skipper of the Blues, has hit a rich vein of form over the past seven weeks in particular. During this timeframe, Patty has notched up six hundreds, allowing for a seven-game average of 122. At this stage of the Fantasy year, having a premo in this type of form will likely prove invaluable. Negatives: Consistency: The superior form of Patty Cripps has been touched upon, but eventually form does change. Will he be able to keep up the high scores across the final month of home and away season football? Evidence from earlier in the season hints that his consistency hasn’t been a super-strong point across the years entirety. The eight sub-100 scores are annoying for owners this deep into the year. The great majority of thee double-figure scores have come in clusters, could another form dip be on the horizon? The Tag: If you’re dominating games to a Brownlow Medal standard, opposition attention is surely not far away. The Blues don’t boast a star-studded lineup, with Marc Murphy (who has had his battles with injury) the only other potential candidate for the tag. Crippa has been most noticeably tagged on four occasions this season. In these games he averages just 86 points. Although he doesn’t face any of those four teams again this year, a tag has been proven to slow down Cripps’ scoring. Positives: Ceiling: Macrae flew out of the blocks earlier in the year and has continued to score heavily ever since, despite injury sidelining him for three games. A scintillating first month saw Macrae take the lead as the early Brownlow favourite, producing scores of 109, 134, 116 and 128. After 99 against the Dockers at Optus Stadium, Macrae erupted into a point-scoring frenzy, averaging an almost unheard of 148 over the span of four weeks with four consecutive scores of 140+. Since then his scoring hasn’t been quite as ginormous, which is to be expected, however he has still managed to score 100+ in every game bar one (disregarding the injury affected 44). It’s obvious the height of Macrae’s ceiling is high. Consistency: So whilst Macrae has pumped out some monumental efforts, crucially, his consistency has still been strong. At-times he has battled with a tag but managed to come out the other side victorious and still post a big score. The first round draft pick from 2012, Macrae had gone sub-100 just twice, and even those scores are hardly worrying (99 and 76). Ceiling and consistency both get big ticks from me. Fixtures: The Bulldogs will miss the finals for the second consecutive time since the unforgettable Grand Final win in 2015. However they finish this season with some reasonable fixtures. On Saturday afternoon, Macrae’s side play host to the Saints who are ranked 12th for points against and 13th for 100’s against. He definitely a captain candidate in this one. The Dogs then verse North Melbourne (ranked mid-table in the key points against indicators) before meeting the lowly Blues (15th for points against and 14th for 100’s against) in a game where Macrae will more than likely explode. The final game against the Tigers appears a difficult one, however Richmond sits middle of the pack for points against and tons against. Negatives: Tag: For a guy with such a well balanced game, it’s not easy to pick out a genuine negative associated with pick him up. However teams have sent a guy to him on a couple of occasions with varying levels of success. Fremantle’s first-year midfielder Bailey Banfield kept him under 100 (99) and renowned Eagles tagger Mark Hutchings restricted him to just 76 over in the west. Although he well and truly beat Adelaide’s Sam Gibson by scoring 144, could the Blues, ‘Roos, Saints or Tigers look to quell his impact in the near future? Verdict: I’m all for bringing both of these guys into your midfield if the situation allows. Both stars have high ceilings, perfect for this time of the year, but have been suspect to the tag in previous weeks. Choosing one is a difficult decision, but I tend to lean towards Macrae. Positives: Consistency: The large majority of Fantasy coaches assumed that with the return of favorite son Gary Ablett, who joined the already powerful midfield unit comprised of Danger, Jelwoood and Duncan, Menegola’s fantasy relevance would be significantly reduced. However this hasn’t been the case. He started off the year with scores of 68 and 50, but has gone under 80 just twice since (65 against the Giants and 71 against the Bombers). His heat-maps suggest Menegola has been particularly effective right in the middle of the ground, but on the whole, his disposals have been pretty spaced out. Ceiling: Running your eyes over some of Menegola’s scores from this season, his ceiling really stands out, having managed to produce four scores of 120+ (120 x2, 121 and 125). So whilst he has been able to ton up on a consistent basis, it is also encouraging to see the former Hawk and Docker go big. He has a well-rounded game, in terms of statistics, with his disposal, mark, tackle and goal numbers all strong. Negatives: Previous Role: The negatives are limited, but after the first two weeks of 2018, the poor form of Menegola saw some owners trade him out. Since then he has been terrific, however if he was to revert to the role which saw him struggle to hit the ground running, then his scoring will likely be affected. Form: Menegola has struggled a touch over the past five weeks, managing just one hundred in this period. Whilst his scoring hasn’t been at all bad (91, 82, 115 and 97), these numbers aren’t what you should be looking for in a premium forward at such a critical time of the season. Positives: Form: Up until round 13 Josh Dunkley had managed just one score in excess of 100 (117 in the 7-point loss to Sydney). Since then, the son of former-Swan Andrew Dunkley has taken up a role on-ball, managed four tons and a 99 for a monthly-average score of 108. The form he is in ranks Dunkley as the second-best forward, behind only Essendon boom recruit Devon Smith. Although some of his scores haven’t reached the heights of guys like Hawkins, Smith, Breust or Dangerfield, Dunkley has been super consistent. Not only is he winning more of the ball, Dunkley has laid 39 tackles in the past five matches – propelling him into a strong position with an improving average of 89. Uniqueness: Josh Dunkley’s name doesn’t spring to mind amongst coaches when thinking about premium forward options. His ownership had stayed below the 1% mark up until last week when the Premiership players form was clearly no longer a flash in the pan. This week, he has managed to force his way into Roy’s famous rolling 22. Dunkley has firmed as a terrific, unique forward line addition, with only 1% of the top 100 coaches owning him. Negatives: Can He Keep It Up? : As Roy stated in his rolling 22 article, Dunkley has enough runs on the board now to install confidence in him as a premium option. However it was only a few months ago when he was struggling to get ahold of the footy and even lost his place in the Bulldogs side for a three round period. With a month of football still to be played, is there enough evidence to indicate he can keep this form rolling until the final siren sounds in round 23? So far in his young career, I would suggest perhaps not. Ceiling: Whilst Dunkley has been one of the most consistent forwards over the past few rounds, his ceiling leaves a bit to be desired, with a top score of just 117 extending back to round four. Almost all of the other premium forward options boasting high scores far higher than Dunkley’s. He’s no match-winner, if that happens to be the type of forward you’re after. Verdict: Whilst Sam Menegola has been the better performer across the seasons entirety, Dunkley is the man in form at the right time. Both equipped with MID/FWD dual position status, I prefer the Western Bulldog in this situation. What about Macrae v Crouch? Who would you choose? Shuey vs Rocky or do I hold Tim Kelly for 1 more week and upgrade to a full premo like Macrae next week? So you want to trade Cripps out? For the last time in 2018, Tom looks at some head-to-heads. Tom puts a couple of midfielders and a couple of unique defenders head-to-head. A couple of big MIDs and a couple of in-form DEFs go head-to-head. Which ruck and which defender are on Tom's agenda today.